Multum in parvo: This is the age old Latin expression that has so appropriately become the motto of the Pug. It literally means “A lot in a little package”. Though it is not known with whom this saying originated, it is certainly safe to say they knew what they were talking about when it comes to Pugs! Anyone who has been fortunate enough to share their life with a Pug understands just how deeply they touch the soul. Pugs quickly become our best friends, and true members of our family. It is not uncommon to see ownership of Pugs run in human families, with several generations all choosing to own the breed. There is truly no better company than a Pug. They have been credited with lowering our blood pressure, improving our mental health, and generally contributing to an increased life span. Pugs have long been favorites for their unique and quirky personality, often referred to as the “clowns of the dog world”. 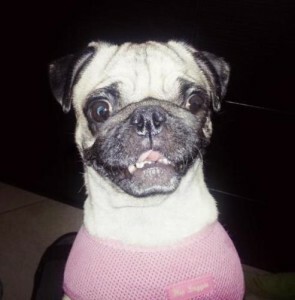 If you are looking for a companion dog, a Pug simply cannot be beat. They are loyal, constant and devoted friends. Pugs generally attach themselves to one person, or a small group. This becomes their core family, with which the Pug will shower them with undying love and adoration. Pugs will stick with you like a shadow and are constantly craving your affection and your attention. If you are looking for an independent, self sufficient dog, a Pug is probably not the best choice! They do not wish to be left alone to amuse themselves. Pugs expect to be treated like any other member of the family, and included in all activities. They can be a bit demanding at times. Pugs learn quickly, but sometimes obeying can be a different story. Pugs have been known to be a bit stubborn at times, especially the girls. Pugs are anxious to learn and willing to please as long as it is done their way. However, food can change the entire situation! Pugs are gluttons and will do anything for even the tiniest scrap of food. Since food can be the center of their world, strict diet control is very important. I read that a Pug’s colossal appetite is legendary, if the subject is food, the answer is yes (Barron’s Pug Manual). Pugs are very curious creatures, and sometimes this can get them into trouble. You have heard the expression, “Curiosity killed the cat”, the same can be applied to Pugs. It is important to always be aware of your surroundings, so these little investigators don’t get into anything harmful. Pugs are fearless, especially for their size. They are often noted for their bravery, along with their charm and wit. Pugs are also known for their love of people, especially children. They don’t just tolerate kids, they love being around them. Pugs also get along well with other pets. Sometimes it is nice to have another companion in the household to keep your Pug company. Often times, you will see families with pairs of pugs. Do take into consideration that more Pugs equals more Pug hair. One of the few downsides to owning a Pug is the excessive shedding. Pug hair truly takes on a life of its own. “If there is ever a nuclear war, the cockroaches that inherit the earth will be wearing tiny sweaters made of Pug hair” (Barron’s Pug Manual). Overall, Pugs are amazing little dogs that are devoted to their loved ones and have a smile on their face each and every day. No one will ever be happier to see you than your Pug each time you walk through the door. A Pug’s unwavering devotion cannot be matched. You truly are the center of their universe, and your life is so much richer for having shared it with this unique character. “A Pug gives you the convenience of a toy breed, the heart of a giant, the bravery of a terrier, the intelligence of a herding dog, and the face of a clown” (Barron’s Pug Manual). I truly believe a house is not a home without a Pug!